A smooth pencil that delivers dense, black tones and can be sharpened to a fine point. 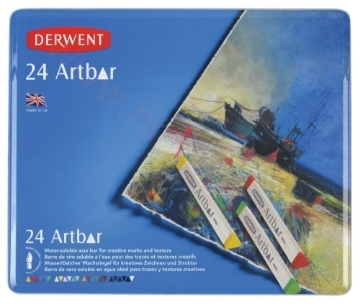 It is a set of Solid stick of pure watercolour with a peelable wrapper. This set includes: Zinc Yellow, Middle Chrome, Deep Vermillion, Magenta, Dark Violet, Light Blue, Prussian Blue, Emerald Green, Sap Green, Raw Umber, Venetian Red and Ivory Black. This set incliudes: Primary Yellow, Primary Red, Strawberry, Iris, Primary Blue, Kiwi, Honeycomb, Paprika, Pacific Blue, Green Earth, Prairie, Raw Umber, Wheat, Mango, Blush, Blue Lace, Spearmint, Beige, Burnt Umber, Alizarin, Dark Indigo, Dark Forest, Black and Opaque White.